On May 5th 2014 when Atiku was still nurturing the ambition to be APC presidential candidate in an article he published on Vanguard News titled “My Ambition Is Legitimate” in his effort to intimidate Jonathan he said that “if peaceful change become impossible violent change becomes inevitable. When APC chooses Buhari as their presidential candidate he aligned himself with Buhari to push out Jonathan knowing that Buhari will be their for only one term, he was among the cabals that ransomed Nigeria since the Britain and the Queen sent their condolence message on Feb 2017 till the cloned Jubrin returned on August 2017. Atiku knowing that he is not an all acceptable candidate and APC is a finished party as far as Nigerians are concern due to their bad administration knew that if he pick APC candidate and PDP brought a credible candidate like Hon Aminu Tambuwal he will lose the election so he allowed Jubrin to hold-forth for him in APC and defected to PDP and bought the vote of over 1,500 voters to become PDP presidential candidate although he hard hitherto said that he will no contest with a foreigner. If Ohaneze deviate from their initial promise that there will be no election in 2019 if Nigeria is not restructured because Atiku picked Peter Obi as his “Best man” whose only duty is to clean sweat out of the face of the groom. IPOB should not deviate because so many blood has been lost, Nigeria has expired and referendum is the last/best alternative. What ever our political elites are doing they should not forget that Atiku was the first Governor elect of Adamawa state in 1999 election under Alex Ekwueme camp that abandoned Ekwueme and crossed to Military/Obasanjo camp. Let all and sundry never forget that Atiku is an inconsistency personified. Bishop of Canterbury Justin Welby visited Atiku weeks after he won the PDP candidacy Why?. Truly Atiku has won the election even before the voting just as Buhari won the election in 2015 before the election but my question is when will Nigeria be free from being a slave to Britain? 105 years are too long to continue to maintain the same status-quo and 59 years of foolish independent. 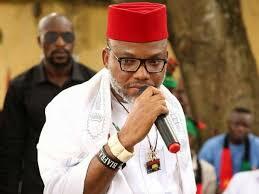 Nnamdi Kanu more grease to your elbow.